Luxury vinyl tile from Mannington: Meridian Max (steel). 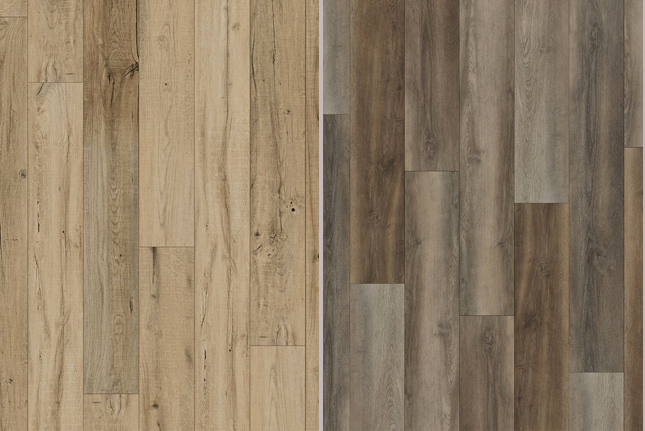 Two COREtec flooring types with that real-wood look: Valor Oak (left) and Silver Dollar (right). 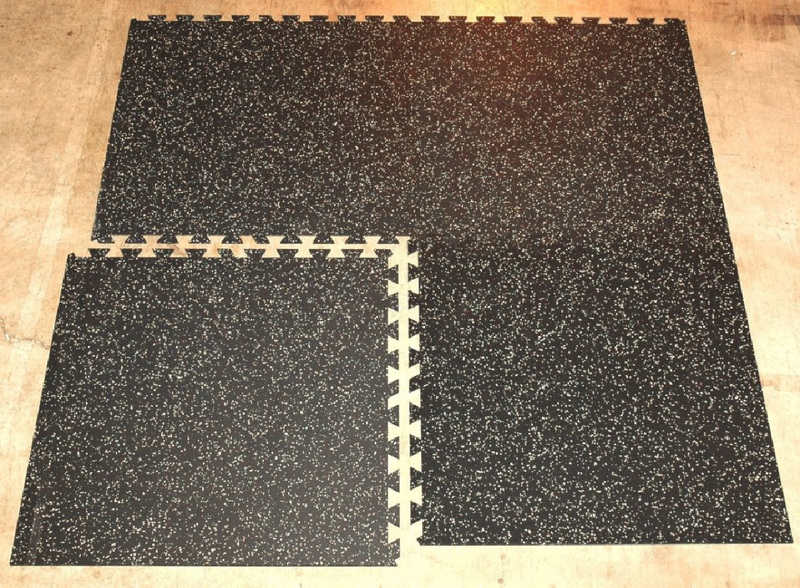 Example of how interlocking floor works—this one with rubber. "That has to kind of flow together," said Balian. "Once you go into a different room, that can be totally different." Furthermore, Wyzard uses the possibility of multiple surfaces to alert customers to less expensive options. "When you do hardwood surfaces, I always price out the bedrooms separately to let them see the difference," she said, noting the potential savings of doing a room or two with a less-expensive material. "I try to give everybody options." Of course, if an Eichler still has operable radiant heating, that may be a consideration as well. Wyzard said, however, that the growing popularity of radiant heat in recent years has forced flooring manufacturers to adapt their product accordingly. "They've all got certain acceptances for radiant heat [now]. You just have to do your homework," she advised. "You have to check the warrantees. That's the first thing I do is check the warrantee [on preferred materials] when I'm dealing with customers with radiant heat." The biggest change in the flooring industry, though, is the advent of 'click system' installation, which requires no adhesives and allows for flooring materials to ‘float' and be pulled up if needed before being reinstalled. "If something happens, you can always take it apart and put it back together," said Balian. "With a click system, it's like doing a puzzle." Another new development in flooring is 'loose laid' surfaces that can be even easier than click systems to remove and reuse, but Wyzard believes the new systems are "too young," adding, "I don't think we've experienced the failures yet." There is a subtler change in flooring an Eichler, however, that Wyzard has been pleased to see. "It's interesting that for the first time, purchasing flooring is not just [based on] the period of the house," the industry veteran noted of changing priorities. "What has become the norm is not that it's an Eichler, but [rather suiting the customer's] lifestyle." Consequently, just as important as what material you choose for flooring is one last piece of advice from Vick Balian: "Don't follow somebody else's path. Do what you like."